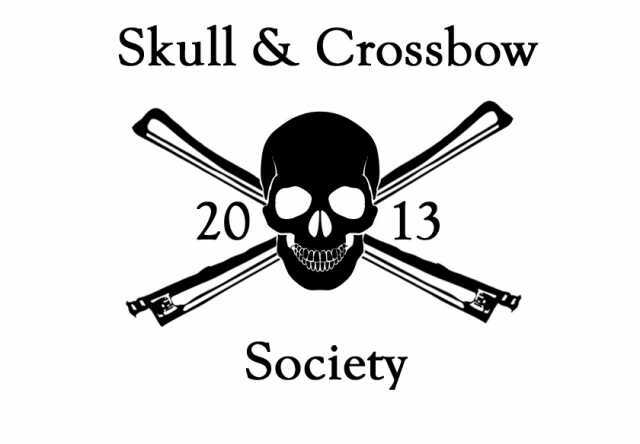 Skulls & Crossbows, Updated pics! Last year, I goofed around in Photoshop and created a funny, fiddler pirate flag with crossed bow's which everyone seemed to enjoy! Well, I recently revisited those pics and made some nice changes to clean them up! Let me know what you guys think! Feel free to use them for whatever you like! Maybe I can make a flag for my sailing vessel out of the last one. That would be awesome! The funny thing is, I arranged them in actually "flag" size! LOL Hoist the colors!! 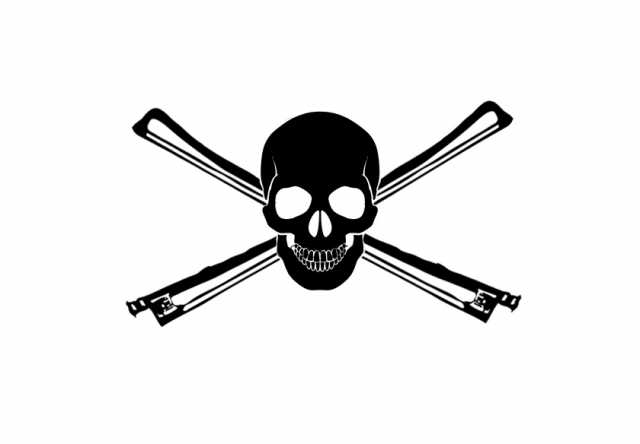 I really want to turn one of them into an iron-on patch for my violin case. 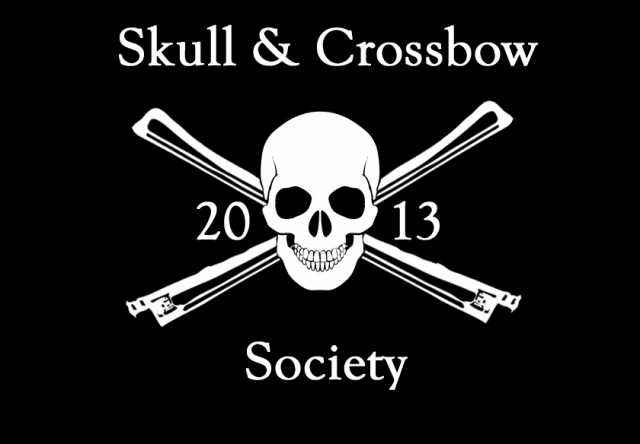 That, and possibly make a bandanna. There's a couple of companies out there that will take an image and print them onto fabric. I just have to find a good one! The great thing about these edits is that the samples used in them are "freeware." Meaning you don't have to worry about copy-writes or trademark infringement. ........that, and I edited the samples beyond recognition! LMAO Hey?!? I had to make them look like they were drawn or painted! Oh wow!! I didn't know that!!! Perfect timing!! I think we need to throw a Pirate Party in honor of that day! LOL I love how these parties are taking off! Cool! My husband loves that song. After we went to Disneyland earlier this year, he had to get the sheet music for it. We've both worked on it a bit, so if somebody starts a Pirate Party in time for "Talk Like a Pirate Day" (hint, hint), maybe he and I can do a duet (if I can twist his arm). I can see it now. You're a little too close to Cuba. The Coast Guard boarding your boat. @EJ-Kisz Nice! But your arrangement is a tad off. It should only have 12 bars. Delete bars 4-7 and 17-24 and just have a repeat at the end of bar 16 (which would be the new 12)! That way it is perfectly correct and we can sing to it too!! It's definitely a catchy little toon. 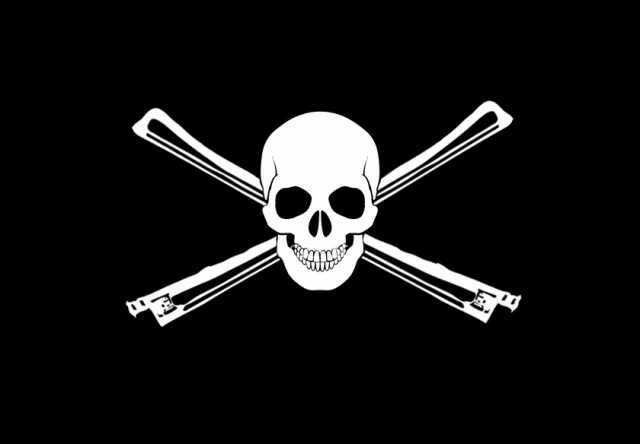 I like your pirate flags - very cool. Funny story about that music. We were at Disneyland, on the Pirates of the Caribbean ride and it broke down. We were stuck in our little boat for about a hour before they could get us all out, and the music played over...and over...and over...and over... it took me weeks to get that song out of my head.... And now It's back! I love it, and of course need to learn to play the song! Oh, I see what you mean! LOL Don't laugh, but I've never been to Disney World, let alone the ride! 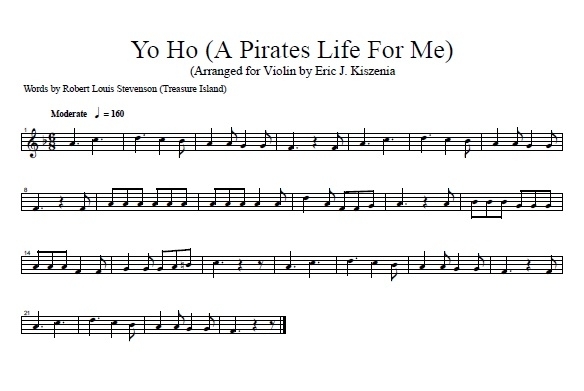 I only know it from the movies and playing different pirate suites at concerts in college. .....which reminds me, I really need to find "March to The Scaffolds!" That song was so much fun and easy! It was all about dynamics! Any-who, I cut those said parts (also looked up the youtube video to match the ride!) and attached it to this post! Hope that works! I think that would be a lot of fun! 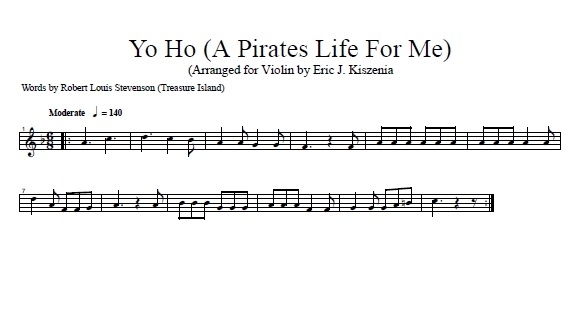 We just need a good list of pirate songs to work from. I really don't see too many of them floating around! I'll see what I can come up with! @Ginnysg YES!! You must learn it! Sweet. Here are the lyrics. Just play the 12 bars for each section below, rinse and repeat! We're jokers and black sheep, we're really bad eggs. HA!! "Stand up, me hearties, Yo Ho!" The video I found still had "drink up!" LOL I wonder when they changed it? It had to be in the 90's sometime. That's when our school cracked down anything alcohol related. Hence, eliminating the song Tequila from our marching band program! Yea, I like "drink up" myself lol. But I was giving the "pc" version that everyone uses! Drink or stand, dealers choice!!! I'm sure we can slow it WAY down! It's tough to sing, but so much fun to play on violin! I was wondering if anybody can help a fellow fiddler out.....I'm trying to put together a song list for the potential pirate party and I'm having a hard time finding fun/popular songs. Can someone help me get a list going? I have a couple of fun ideas for the party, but you'll have to wait and see them, come September! I LOVE theme parties! My Jolly Sailor Bold. I want to learn this song so bad! What else can we add to the list? Popular Sea shanties? What's funny is "A Pirate's Life for Me" is an adaptation of "15 Men On A Dead Man's Chest" if I'm not mistaken. The "Pirate's Life for Me" was created for the PotC movies. Can't have kids going around singing the lyrics to 15 Men lol.